Need help using Old Portal? e.g. For IE Browser: Click “Tools” on Menu bar and then click “Pop-up Blocker” from Tools drop down menu, then select option to Turn Off Pop-up Blocker. See image below. e.g. 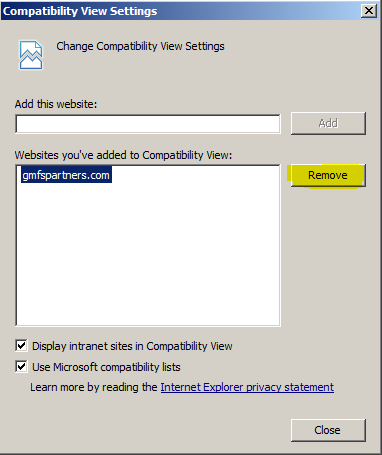 For IE Browser: Click “Tools” on Menu bar and then click “Compatibility View” from Tools drop down menu, if “gmfspartners.com” is listed as a Website you added to Compatibility view, then click the URL to highlight it and then click “Remove” button. See image below. 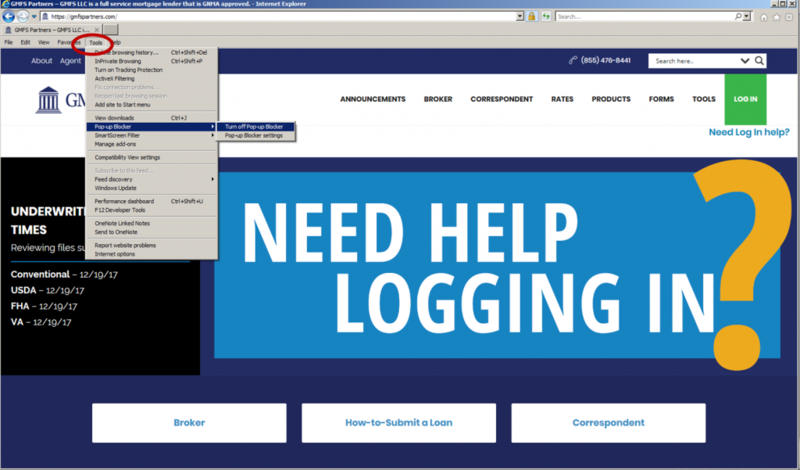 To re-try Log In after using these tips, scroll up to enter your credentials above. We are one of the fastest growing mortgage companies in the United States offering great mortgage financial solutions. Headquartered in Baton Rouge, Louisiana, GMFS originates residential mortgage loans, primarily in the southern states. Founded in 1999, GMFS has approximately 250 employees. Equal Housing Lender. © 2017 GMFS, LLC. Upfront approval subject to satisfactory property review and no change in financial condition. Some products may not be available in all states. All loans subject to credit approval. All mortgages are originated by GMFS LLC at 7389 Florida Blvd. Suite 200A Baton Rouge, LA 70806. NMLS #64997. LA License 619. The retail division of GMFS LLC is Doing Business As “GMFS Mortgage”.